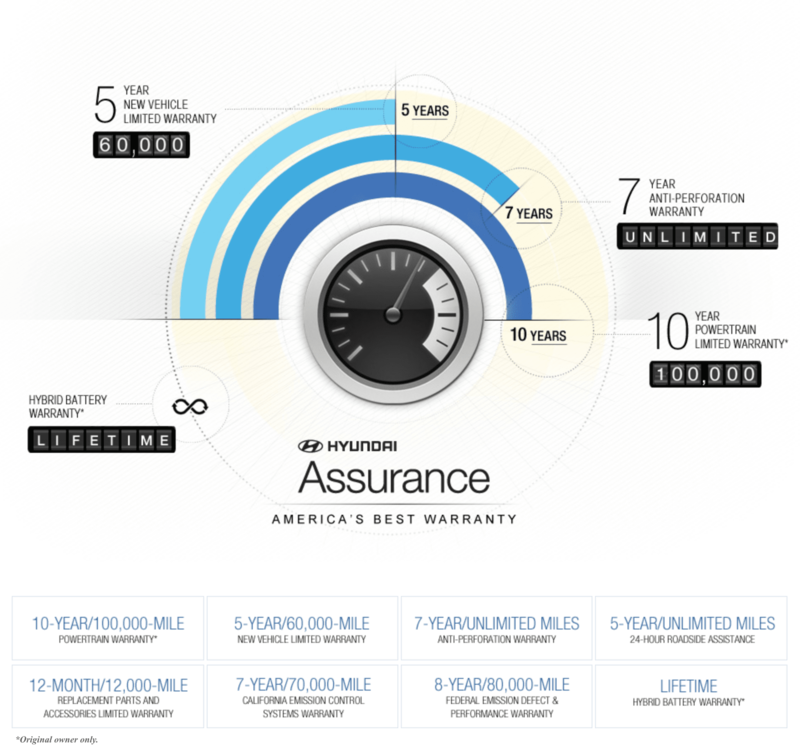 Not every warranty is built the same, and Hyundai is proof of that. 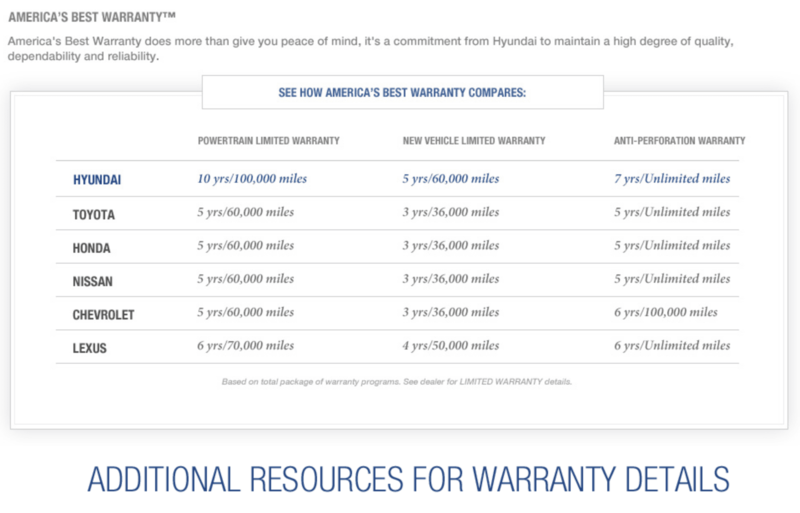 Every new Hyundai comes with America's Best Warranty™-and there's really no trademark needed. Besides giving you obvious peace of mind, what does Hyundai Assurance offer? The newest Hyundai cars, SUVs, hybrids, and EVs all come with this extraordinary coverage. Should any defective powertrain components or systems be found, our Blue Springs Hyundai dealer will perform repairs and replace the components with authentic OEM Hyundai parts. Enjoy your 10 years of unparalleled warranty coverage! Under normal use, your Hyundai and all its hard-working pieces are covered by this limited warranty. Defective radios, batteries, paint, clutches, brake pads-you name it-are all ensured to last up 60,000 miles, with few restrictions. If you've encountered a problem with a factory-installed or stock component, contact our Hyundai Service department near KC for an inspection. Beginning with 2005 Hyundai models-be sure to browse our certified used Hyundai vehicles -this anti-perforation coverage extends for 7 years with unlimited mileage restrictions. If your Hyundai begins to rust through or corrode (thanks to Kansas City's salted roadways), you're covered for replacement body sheet metal. Enjoy 24/7 roadside assistance for up to 5 years with no mileage limits. Call 800-243-7766 the next time you need off-road help or a tow to our Hyundai body shops near Kansas City. For the first year (or 12,000 miles driven), you'll receive complimentary repairs and replacements of any faulty Hyundai part or accessory. Even if McCarthy Blue Springs Hyundai doesn't install the original parts, you're still covered. Just as you'd assume, this warranty covers the replacement of any Hyundai hybrid battery unit. You also receive 10-year/10k-mile coverage for hybrid starters, PCUs, transmissions, and more. Certified pre-owned Hyundai hybrid vehicles come with the same 10-year/100,000-mile warranty on batteries. Ready to share our new and used car dealership's love for all things Hyundai? Contact us at (816) 224-7500 or come take a test drive in a new car or SUV, and we'll show you why America's Best Warranty™ really is America's best warranty. McCarthy Blue Springs Hyundai is located at 3000 NW South Outer Road in Blue Springs, MO, just miles away from Kansas City.